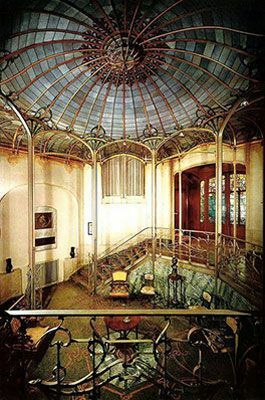 The below artworks are the most important by Victor Horta - that both overview the major creative periods, and highlight the greatest achievements by the artist. 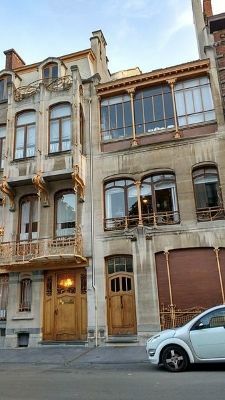 Artwork description & Analysis: The Tassel House, often cited as the first Art Nouveau building. 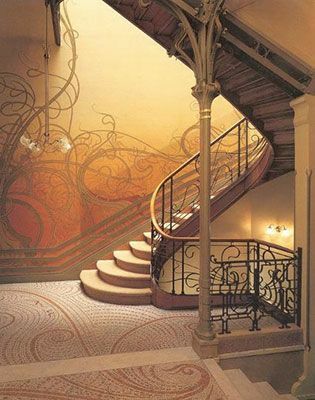 In this townhouse for one of his typical professional clients from the 1890s - in this case, one of his colleagues at the Université Libre de Bruxelles - Horta fuses the twin themes of nature and industry almost seamlessly. 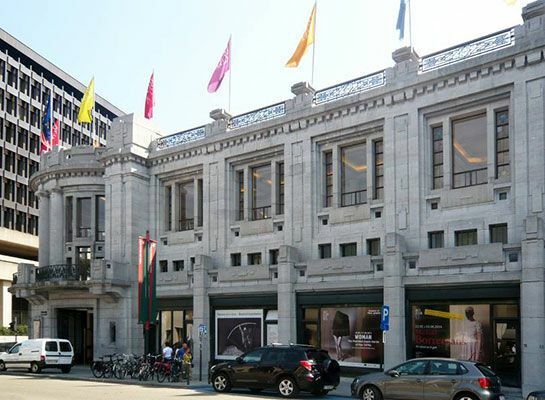 Artwork description & Analysis: The crowning achievement of Horta's career was the Maison du Peuple (House of the People) in Brussels, the new headquarters of the Belgian Workers' Party. It was in many ways a temple of Socialism, as the Maison du Peuple was a common urban structure in several European countries. Maisons du Peuple provided various communal functions that often catered to working-class citizens: libraries, cafes, recreational spaces, bakeries, clothing shops, and a large auditorium for assemblies, along with offices for the local Socialist parties. Thus Horta's structure, the national headquarters for the party that represented the interests of a large sector of the population in highly industrialized Belgium, can arguably be seen as the apotheosis of the building type. 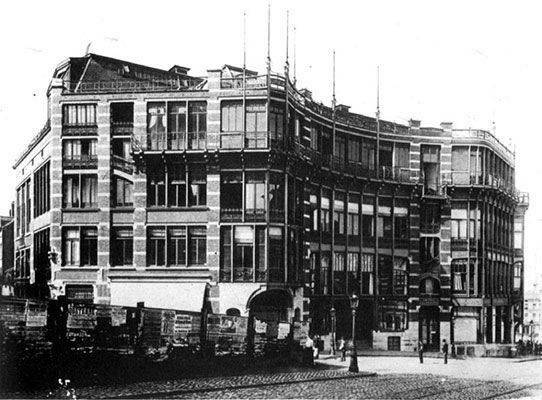 Artwork description & Analysis: The van Eetvelde House represents arguably the most daring and innovative of Horta's residences in Brussels, built in two primary stages; the initial one from 1895-98 and an extension constructed from 1899-1901. As in the Solvay House, Horta was given an immense amount of freedom in design, in this case, for Léopold II's minister for Congolese affairs. While the facade of the house discloses a kind of rationalist, industrial structure, consisting of an iron frame with large windows, adorned with the whiplash curves that had become Horta's trademark. Artwork description & Analysis: Horta's own house and studio are now home to the Horta Museum and constitute an important example of his surviving work. Its significance lies primarily in the way that it acts as a superb piece of rationalist architecture, expertly communicating its function and serving as an advertisement for Horta's own forward-looking architectural practice. Artwork description & Analysis: Horta frequently designed all of the aspects of his buildings, including large amounts of furniture, and was a talented interior designer. The press praised his dining room ensembles shown at the 1902 First International Exposition of Modern Decorative Art in Turin, where Art Nouveau was featured nearly to the exclusion of all other styles. 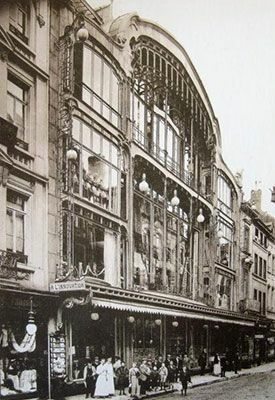 Artwork description & Analysis: Horta was commissioned to design several department stores during his career; virtually all of them were built in a very short period between 1901 and 1906. The branch of L'Innovation that he constructed in Brussels at 111 Nieuwstraat is the best-known and most innovative of these. In it, Horta pushed the skeletal, tensile metal structure to the limits of its capabilities, exposing it to the elements with the simple infill of glass panels on the facade. The result is that the entire facade functions as one massive shop window, allowing everyone outside to see in, and vice versa. Artwork description & Analysis: The Palais des Beaux-Arts, often fondly called "Bozar," a play on the pronunciation of the last half of its French name, demonstrates Horta's conversion from Art Nouveau to Art Deco as the latter garnered followers as a modern version of classicism in the years following World War I. It is a large complex that serves several different functions, and not surprisingly it took nearly ten years to complete. 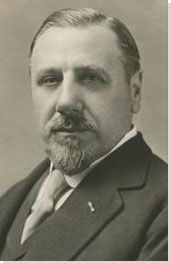 Artwork description & Analysis: Horta was awarded the commission for Brussels' new central railway station in 1910, but delays caused by the two World Wars, logistical problems caused by track access, and funding constraints meant that Horta would not live to see the completion of the structure, which his student Maxine Brunfaut saw through at last in 1952. 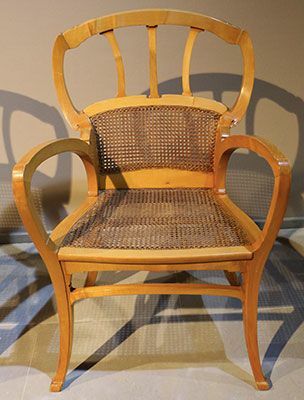 The greater part of the design was worked out by Horta in the 1930s. Part of the biggest challenge before Horta could begin designing the structure was the determination of where the heavy rail lines that would connect Brussels North and South stations - until the 1950s the twin termini of all intercity trains - would run through the center of the city. First published on 26 Apr 2017. Updated and modified regularly.